Italics is often the first choice for formatting letters and other handwritten notes. They are easy to use, don’t require a new font, and are a perfectly acceptable way to make letters stand out. However, as I mentioned in How to Use Italics in Creative Writing: Thoughts, Readability, and More, pages of italics wear on a reader’s eyes and can be difficult to read. If your letters are long, italics might not be the best choice. Another option is to use a different font. If you do, make sure the letter font is easy to read and doesn’t clash with your other fonts. Using different fonts is a love-hate thing. Some editors, publishers, and readers don’t mind it; others really don’t like it. Inside she found a pink pocket notebook with her name written in the curly script of a romance novel etched across the front and a letter. My mom thought you might like to have this. I’m still learning. Please forgive any unflattering lines. You have been one of my favorite people to draw ever since I ran into you in the hospital hallway. The old woman at the fairy tale museum helped me put this notebook together. Now only the people we want to can see the drawings. She says if you don’t want the books she’ll take them. Congratulations on your new job. Thoroughly confused, Kelly glanced at the framed drawing from the only Nazar she’d ever met before picking up the tiny, pink notebook. In this example, the letter is both indented more than the regular text and has an extra space before and after. This formatting makes it clear when the letter begins and ends. The written document also includes the recipient and sender, which helps show the reader this is the actual letter and where it starts and stops. Because of the recipient and sender, this piece could have used either the indent or the extra spaces and still been clearly a letter. If your piece needs a letter or other handwritten document, take a look at the length of the document. Pick a format that not only makes it clear where the document begins and ends, but is also easy to read for the duration of the document. Whoa Boy! Do you realize you just sent out your love note to the entire Poetry Association of the Western Suburbs listserv? P.S.—That mole? You’ve got my imagination running wild. As long as the entire organization knows about it now, would you mind divulging its location? I’d sleep better at night knowing it (196). “Reply All” is written entirely in the form of emails. The premise is someone replies all instead of sending a very private message to an individual and email chaos ensues. In this case the author chose to include the to, from, subject, date, and sender’s name. That makes it clear this email was sent to everyone, when, and who it’s from. Not every email is going to have or need all of this information. What you include depends on the context of your story. If you’re going back and forth between emails as a form of dialogue, include at least the recipient’s and sender’s names or email addresses. These will function like dialogue tags – letting your reader know who is saying what. The extra space and indentation shown in the letter example also works well for emails. I’m not a big fan of using italics for texts and IMs if you are also using italics for thoughts or emphasizing words. If you only use italics for the messages, they can work. However, there are more effective ways of formatting these. BRI: They’ve got the footage from the atrium camera. IZZY: Do they know who he is? IZZY: Worst. Day. Ever (111). This puts the speech tag at the front and is similar to how a play might be formatted. As a bonus, this format would keep it crystal clear who is saying what when the conversation involves three or more people as well as two. I prefer this style of format for IMs in chat rooms because it mimics the look and feel of that type of written communication. Lesley Harrison does something similar in her short story “What’s in a Name?” from Proof: A 30th Street Fiction Anthology. Her main characters are Als, so they communicate in a way that resembles computer code, but is still a written document. When it comes to text and instant messages, these formats that make the speaker and back and forth clear are often the best choice. You can use any of them, modify them, or create a similar format to help your reader know when your written documentation begins and ends. Regardless of the type of written document or the format you choose, it needs to be clear where that written document begins and ends. 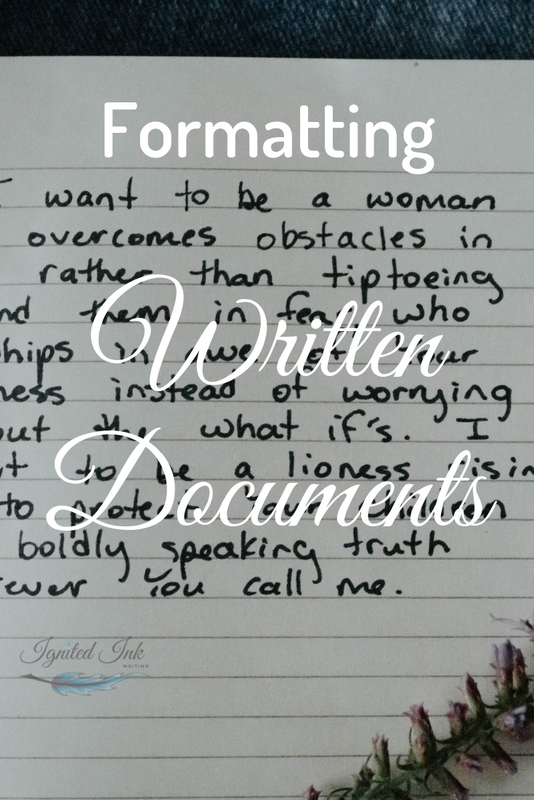 Part of this is the way the writing looks on the page; the other part is transitioning to and from the document in your writing. The sentence before the letter example mentions the letter. That prepares the reader to see the written document. You character could also open their email, unlock their phone, or log into a chat room. All of these prepare your reader to read a written document and to understand the new format. Transitions are key. I am not against italics. I’ve just seen too many writers use them as the default for everything, so their character’s thoughts, texts, and flashbacks are all in italics. This can be confusing to a reader. If the first time you use italics is for thoughts, your reader subconsciously notes italics = thoughts in your piece. When you then use italics for texts, they first read those texts as thoughts. This is confusing. That’s why I recommend formatting written documents in a way that doesn’t include italics if you’re using italics elsewhere. There is no right way to format written communication. What matters is clarity and your personal preference. Try out indents, extra spaces, and signatures to use written documents to Ignite Your Ink. What is your favorite way to format written documentation in writing and why? Share your preferences in the comments below. For more writing advice from an editor a free worksheet on how to use synonyms to develop voice, subscribe to Ignite Your Ink. A key aspect of a character's voice is the words they choose to use. This synonym worksheet helps you zero in on your characters words. You'll also receive notifications when a new article is posted and exclusive advice from a professional editor. Click here to download your synonym worksheet now or wait for it to arrive in your inbox. Good luck igniting your ink! Ignite Your Ink is written by editor and author Caitlin Berve. She holds a MFA in Creative Writing and Poetics, actively participates in multiple writers’ organizations, and is dedicated to helping writers produce content that leaves an impression on readers.